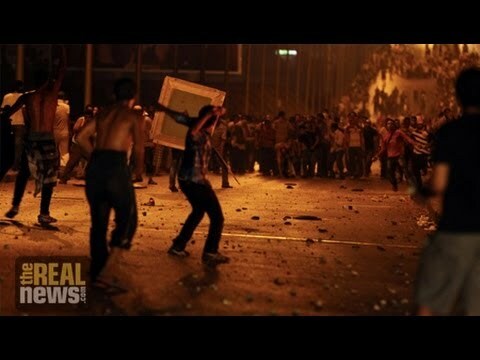 Massacre in Cairo–Egyptian authorities have once again attacked supporters of the Muslim Brotherhood, with at least 74 believed the dead and dozens more believed to be on life support. Police opened fire in a predawn attack on Saturday morning. Egyptian security forces say they were defending themselves, but some reports indicate that no police were killed in the action. This latest round of violence comes in the midst of competing rallies on Friday of opponents and supporters of ousted Egyptian president Mohamed Morsi. Now joining us to give us the latest news from Cairo is Mohamed ElMeshad. He’s a Cairo-based independent journalist who wrote for Egypt Independent for two years. And he’s joining us now from Cairo. Mohamed, what what can you tell us about this latest news of the massacre on Saturday? MOHAMED ELMESHAD, INDEPENDENT JOURNALIST: Well, Jaisal, I was just out there a couple of days ago. Actually, I was out there a bunch the past few days trying to make sense of what’s going on and what’s the nature of the sit-in over there. I would say that, you know, just half an hour after I left, this massacre happened. And whatever was the case, it definitely didn’t seem like people in the square were revving up for war or for any sort of drastic actions. I did ask a spokesman of the Muslim Brotherhood there, Ahmed Aref, a spokesman of the Freedom and Justice Party, the Muslim Brotherhood’s party, whether or not they were planning any marches or any sort of demonstrations. He said, of course we’re planning, but we’re not planning anything drastic. We might move late at night when it won’t affect traffic too much. Of course, they moved around [incompr.] 2 a.m., which is when the shootings began. The official narrative is that these were–you know, as is always the narrative, is that the Muslim Brotherhood were armed to the teeth and they were vandalizing military and public facilities, that they were going up to 6th October Bridge, the main sort of artery in the middle of Cairo, to block traffic. Of course, that doesn’t hold when it’s 2 a.m. and the traffic is at a minimum. The videos that emerged that show the–they were small demonstrations, small marches, and in front of them were security forces, this time police. Before, of course, it was police and the military. And all of a sudden an attack happens. Now, security forces say that they were setting up camps, besides being armed, and this is just part of their elaborate plan to sort of bring Cairo to a standstill and to kind of put Cairo and Cairenes in a choke-hold just with their mobilization on the ground. Of course, in the end, I mean, up till late last night, there was officially around 70 dead. The Muslim Brotherhood claimed that–actually, up to this morning it was 70-some, 72 dead. The Muslim Brotherhood are claiming it was over 127, 130 dead. And, I mean, it’s a massacre. There is no other way to put it. NOOR: So Egyptian vice president Mohammed ElBaradei strongly condemned the violence, and he called it excessive use of force by Egyptian security forces. In a statement, he said, I strongly condemn the excessive use of force and the deaths. I’m working hard in every direction to end the confrontation in a peaceful way. God protect Egypt and have mercy on the victims, he said on his Twitter account. ELMESHAD: Well, I mean, at this point what many people are afraid of and what frankly is just scary or worrying generally is that is this going to be–is this a premonition of what’s to come? I mean, many–some people are finding it as easy to sympathize with the Muslim Brotherhood as before, given, you know, what happened at in the days when Morsi was being ousted, during his last days and what many saw as a very divisive rhetoric from the Muslim Brotherhood and from the ousted president himself. At the same time you see things like this happening, it mirrors what was happening to both the Muslim Brotherhood or mostly Islamist groups, but also all opposition groups and the pre-January 25 Revolution days. So when Baradei saw something, talks about how he condemns the excessive use of force, it just reminds us of of what we’ve been going through for the past 60 years. And that, quite frankly, is what a lot of the pro-Morsi advocates, pro-Morsi people are afraid of. Now, at the same time, we have a lot of–there’s this group called the Third Square who are claiming to be anti-Muslim Brotherhood and anti-military rule, and they are people who claim to represent, you know, a way forward, a break both from the security past and the divisive and quite damaging year that the Muslim Brotherhood had socially. So what Baradei’s saying–I mean, I’m wondering whether or not he’s thinking is did he make the right choice or is he going to continue fully backing the military regime–or I guess it shouldn’t be called the military regime now, but he’s wondering if he should be continually backing the way things are going from a security perspective. The Muslim Brotherhood supporters, the pro-Morsi supporters seem to be, you know, upping the martyrdom rhetoric, and the more people buy it–doesn’t seem like they’re losing any sort of momentum. Of course, it will–you know, it takes a toll. It will discourage a lot of them. But it just seems like we’re moving more and more into a deadlock. And, you know, their condemning excessive use of force doesn’t really take us as far as it should, you know, in the post-Revolution, you know, post–in the time after the defeat of the security forces on January 28, 2011, when people thought we were rid of police oppression. NOOR: And the role of the United States in this–the United States has still not called the removal of President Morsi a coup. And in a statement, John Kerry responding with this latest massacre, he said he hopes the country will take a step back from the brink. ELMESHAD: Well, I mean, Catherine Ashton is supposed to meet the interim president, Adly Mansour, today. You know, I’m interested to see what will come out of that meeting. It seems for the most part that the U.S. is willing to–you know, just doesn’t want to lose its major ally in the region, I mean, at least its major geopolitical ally in the region. I’m not surprised. I’m not surprised. I mean, when the Muslim Brotherhood came into power, what should the U.S.’s role be? In general I think the U.S. is even trying to figure it out. You know, the United States supported the Mubarak regime wholeheartedly, you know, to the criticism of, to the critique of many. And, you know, moving forward, I think that the U.S.–and what the U.S. has shown is that it’s going to be very cautious. Kerry has been cautious every step of the way. He didn’t want to be–he didn’t want to call it a coup. Right now, however, there is going to be–there’s an excessive use of force that’s been happening. The next few days will also be very interesting. The spokesman for the military yesterday said that he calls on all citizens to stay away from the protest, you know, basically for their own good. And then he said, this isn’t a threat, this is just a warning. So, many–I mean, it’s very easy to surmise that there’s going to be much more death in the coming days, probably from the pro-Morsi crowd. The military does have the backing of a whole lot of the population. Maybe it’s a majority. Probably is, actually. But what’s going to happen in the next few days will show us whether we’re going back into this security apparatus, this U.S.-backed security-centered regime, or if there actually will be hope for true change in the future. NOOR: And, Mohamed what do you make of this ultimatum the Egyptian military has given to the Muslim Brotherhood to join the political transition or face the consequences? And what do you make of assertions by some analysts who say that this massacre is just the latest indication that Egypt is sliding into the state of affairs that existed under Mubarak without Mubarak in power? ELMESHAD: Well, Jaisal, first of all, the military ultimatum has passed. And I was actually there early on, early yesterday morning and throughout the majority of the day trying to–waiting, basically, to see what’s going to happen. Like I said, it’s probably a premonition of more bloodshed. There’s probably going to be a violent removal of the square. I don’t see–now that there’s so much blood, you know, on the hands of the security forces and the hands of the Muslim Brotherhood leaders, I mean, now, after so much blood and so much bloodshed, it’s difficult to see this sort of just fizzling away without a proactive response from both sides. I mean, yesterday the scene at the field hospital in the [[email protected]@we] sit-in, the pro-Morsi sit-in was just atrocious. And then the atmosphere for the next two days was one of kind of, like, acceptance and, you know–I mean, defiance, I would say. So, you know, the ultimatum has passed. The military has not made any friends in the pro-Morsi camp. The pro-Morsi camp has not given any indication that they’re stepping down. As for the return of the security apparatus or what we spoke about in terms of the analysts’ opinion, I’ve heard many such analyses. And to be frank, it’s not really analyses at this point. It’s the reality. I mean, the minister of the interior, basically yesterday he said something that a lot of people kind of glossed over in a very odd way. He said, we’re bringing back the political security. He said, there are a few departments that weren’t functioning under Morsi’s rule, such as the political security, the religious security, and detention and questioning of opposition or questionable political figures and questionable religious figures. I mean, they said, frankly, we’re bringing it back. He claimed that there was no live ammunition used against the protesters, the pro-Morsi protesters, which–I mean, you don’t even need to go to the Muslim Brotherhood or the pro-Morsi rally to understand that they were shot at with live ammunition. You need to go to the official autopsies from government hospitals that say that many of these deaths were caused by live ammunition to head and chest. So, you know, the fear is very, very real. The most telling sign of whether this is a reality or not or this fear is going to be a reality or not will be how the military sort of react to the political scene over the coming year. You know, if the Muslim Brotherhood chooses to join this roadmap, then it would be interesting to see whether or not they are accepted. Although I suspect–and this is just me–I suspect the security apparatus, including the military, think–you know, understand that this would be an impossibility for the Muslim Brotherhood to re-ingratiate themselves or, you know, willfully throw themselves back into the fold of mainstream politics without Morsi getting back into power. NOOR: Mohamed ElMeshad, thank you so much for joining us. And we’ll keep following these developments.